Occurs throughout England and Wales although scarcer in the north and seemingly mostly coastal in the west country. With records scattered across Scotland except the far north. Generally the most common Elaphrus (Lindroth) but not so around Watford where the similar E.cupreus Duft. is much more common and widespread. Locally we have found riparius only on Common moor, either on open wet ground in the spring or, later when the moor is dry, among riparian vegetation. They breed in early spring and the predatory larvae develop through the summer. Adults are active in bright sunshine, often in company with E.cupreus and other riparian carabids, avoiding competition by taking different sized prey ¹. Easiest to find by searching wet mud among waterside vegetation during hot weather but they scatter quickly and are difficult to follow. Adults are active from April onwards, during the 1980's specimens were occasionally found during the winter among pondside debris at an Uxbridge (Middx) locality, at this site (TQ059866) they were very common indeed during the summer. The four British Elaphrus species are very characteristic and can only be confused with each other. 6.5-8mm. Head including eyes wider than pronotum, mandibles prominent, antennae metallic green with red lustre. Pronotum quadrate, widest at middle and strongly sculptured. Head, thorax and elytra metallic green but usually with a weakly contrasting lustre. Each elytra with a shiny elevated field anterior of middle and other smaller ones arranged in longitudinal rows although these are variously obscured by puncturation and surface sculpture. Between these are large round depressions; violet and appearing edged with silver in strong light. Legs long, femora metallic green, strongly microsculptured, tibiae red but darkened and metallic at apex. 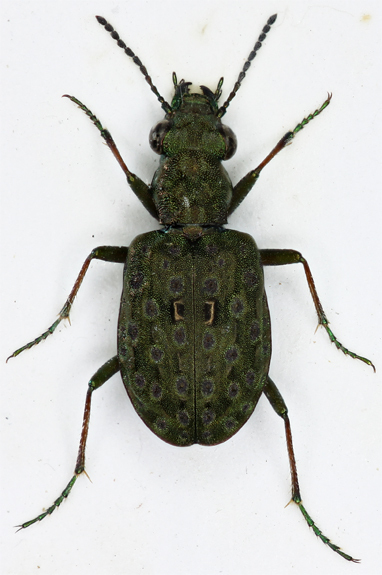 Tarsi shining metallic green (cf E.cupreus), if there is doubt over the tarsal colour the prosternum needs to be examined, in riparius it is pubescent (cf cupreus), a condition also seen in E.lapponicum (Gyll) ² but this is larger &ge;8.5mm. Male with 3 dilated protarsal segments. ² A very local mountain species, Scottish highlands only (Luff).